WHO ARE THEY: Sophia Sandoval and Jim Ritson are partners in life as well as in business. Jim has lived in Long Beach for about 20 years and Sophia moved here from Pasadena 11 years ago. We have a 9 year old son who attends Gant Elementary School. We started 4th Street Vine at 2142 E. 4th St. in November 2008 in Long Beach in an area known as Retro Row as the recession was unfolding. The space we leased was an old thrift store that we transformed into a beautiful space with finished concrete floors, exposed brick walls, and open wooden truss ceilings to create a community wine and beer bar with live music, an outdoor patio, rotating art shows and a space for all types of gatherings. On November 4th of this year 4th Street Vine will celebrate its 10 year anniversary. 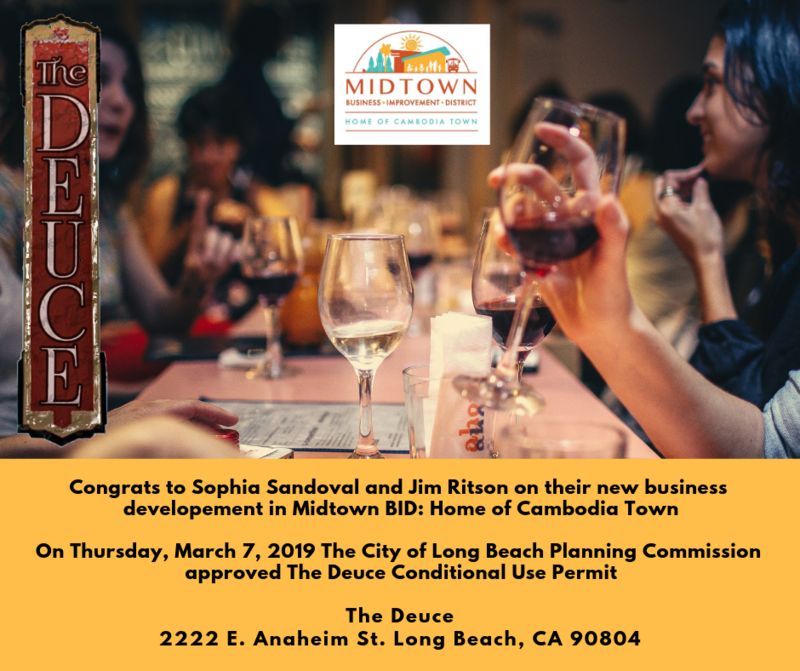 Sophia and Jim both serve on the Board of Directors for the 4th Street Business Improvement District and look forward to being active members of the Midtown BID on Anaheim as well. In 2013, 4th Street Vine partnered with Paradies-Lagardére to open a location in the Long Beach Airport terminal. That location added food and full liquor offerings to their concept and it has been successfully operating for 5 years. WHAT ARE THEIR PLANS: We recently purchased the liquor license from Black Light District (a Long Beach bar which closed on June 25th, 2018) located at 2500 E. Anaheim. Our intention is to re-brand 2222 E. Anaheim St into a new concept that will be called The Deuce (due to the four “2’s” in the address) and transfer the liquor license to that address. We will make the necessary upgrades to create an inviting and comfortable cocktail lounge. WHAT IS THE DEUCE: The Deuce will be a modern cocktail lounge. The current space will be re-branded and transformed to create an ambiance that will be casual yet sophisticated. The bar will include wine, beer, and cocktails, as well as a curated juke box. WHEN WILL IT OPEN: Our plan would be to open in Winter/Spring 2019. We hope you are excited for this new business development as we move forward and we welcome any questions you have for us. http://mbidlb.com/wp-content/uploads/2018/11/MBID-Logo-300x232.jpg 0 0 monorom http://mbidlb.com/wp-content/uploads/2018/11/MBID-Logo-300x232.jpg monorom2019-03-11 19:02:102019-03-11 19:02:12New Business Coming Soon! 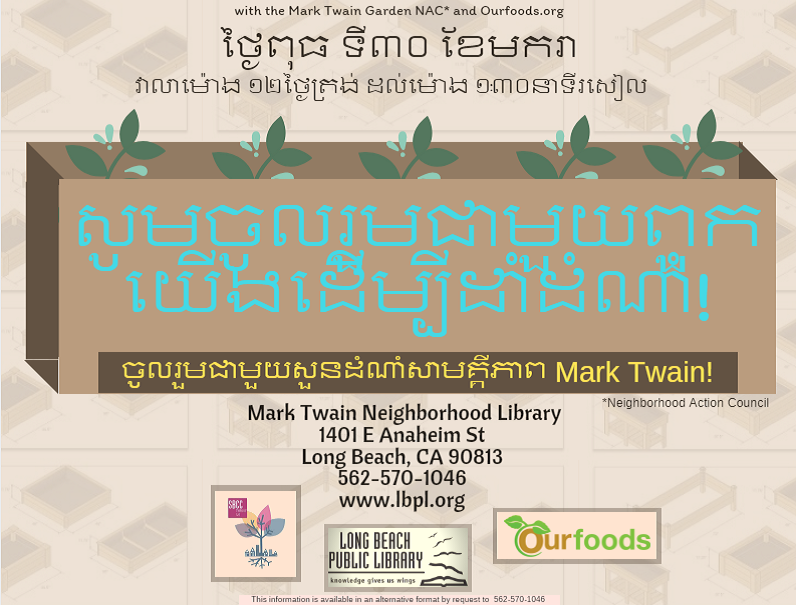 Join in every Saturday as Mark Twain Library host Khmer Storytime bringing in Folktales to our young generation. Thank you for your help supporting this program and the library! 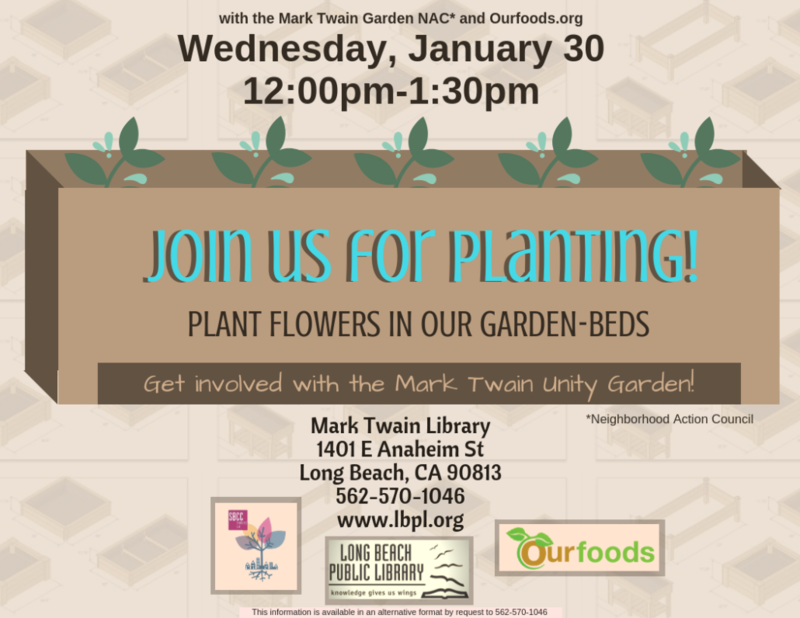 Get involved with Mark Twain Unity Garden! 12:00 Noon to 1:30 PM. 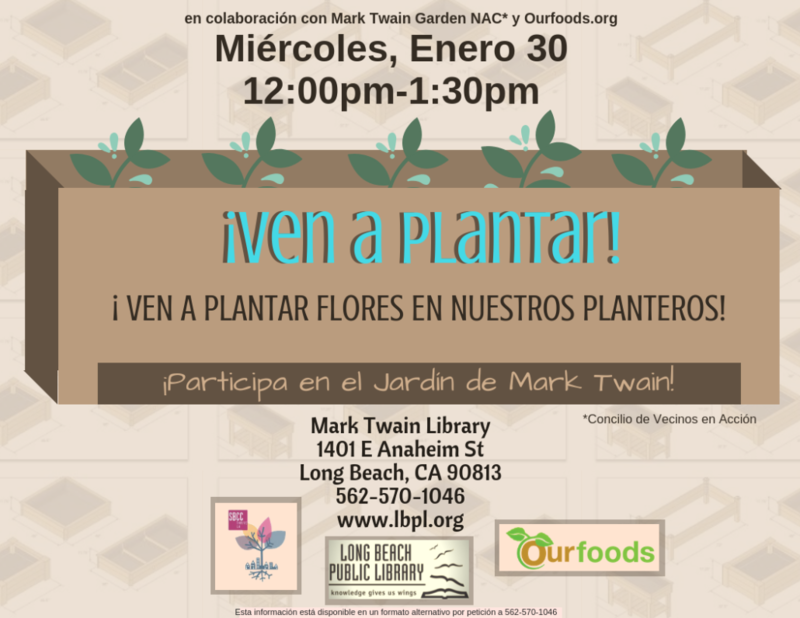 This event is brought to you by the Mark Twain Library and the Neighborhood Action Council.